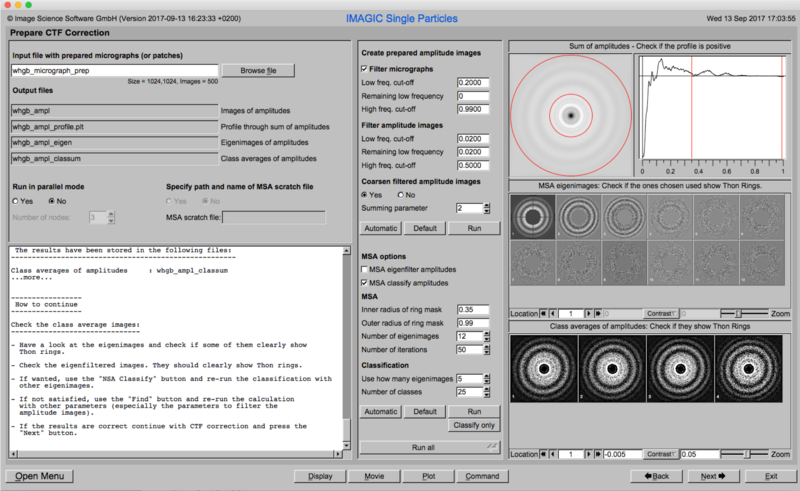 The idea of GISP is to guide the user through a typical single particles analysis. The workflow consists of several pages. Each page will perform a specific image processing step. If the calculations are finished the results are shown and you can click the “Next” button to continue with the next page. If you do not want to follow the workflow you can skip pages, you can use single pages only, you can use "Display" or "Plot" only etc. Using the "Command" button you can run each IMAGIC command which you know from the line-by-line version. "Browse" and "Display" button allow to easily browse for input file names and to display the results. An introduction / manuals can be found on our manual pages. GISP will be distributed together with the IMAGIC package.